Regiment/Catrawd: 3rd Division Cyclists Coy, and 1st Australian Machine Gun Coy. Military Cemetery/Memorial / Fynwent milwrol: Lijssenthoek Military Cemetery, West-Vlaanderen, Belgium. Thomas Edward Hughes was the son of Thomas and Sophia Hughes, and was born at Rhyl about 1893. In 1891 the family were living at 25 Aquarium Street, Rhyl, also described as Burton Stores. Thomas senior, 37, is described as a barman, born at Llanrhaiadr, Denbighshire. Sophia 36, Mary Maria 14, Annie Sophia 10, Thomas Edward 8, and Howell Hugh 1, had all been born at Rhyl. Private Thomas Edward Hughes, Australia, brother of Mrs G. Brookes, 3 Brighton Terrace, has died of wounds received in action on October 4th 1917. 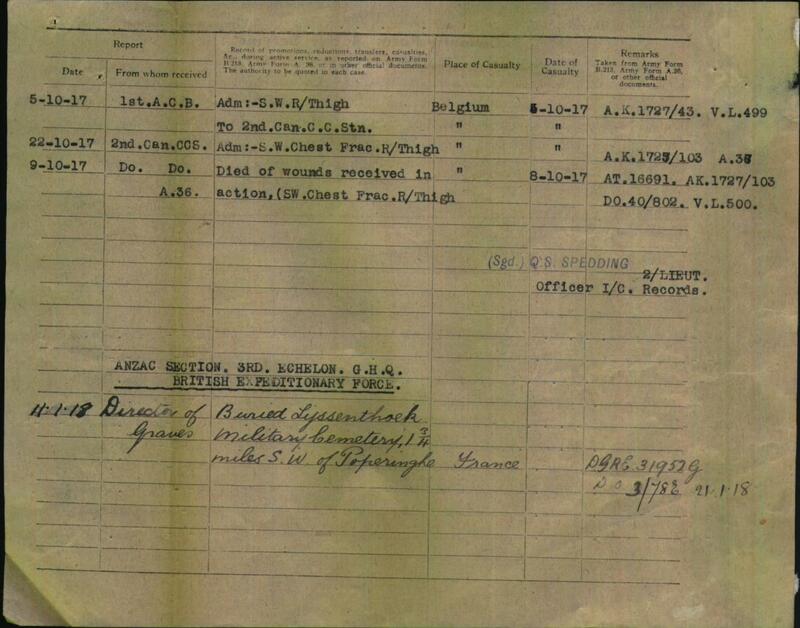 Thomas’ army service records are available on the Australian Service Records website, on Ancestry. He enlisted on April 17th 1916, in the Australian Imperial Yeomanry. His age was 33 years and 8 months, he was not married, and his occupation was a builder. His next of kin was his sister, Mrs Lilian Brookes, of Brighton Terrace, Prestatyn, North Wales. His medical examination took place at Victoria barracks, and we know the following details. He was 5ft 8ins tall, his weight was 146lbs, and his chest measurement was 38 inches. His complexion was sallow, and his hair and eyes were brown. He had a hernia scar which was three months old. His religion was Church of England, and he was described as a British born subject. He was passed as fit for active service. He was attested and subscribed on 20th April 1916 at Roseberry Park Camp, New South Wales, for the duration of the war plus four months. 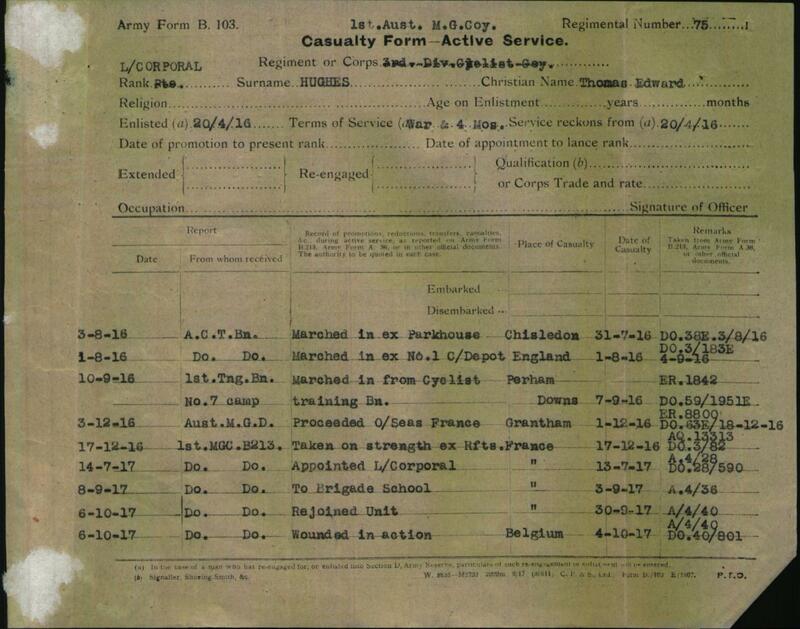 Thomas’ “statement of service” shows that he first enlisted in 3 Division Cyclist Company, where his rank and number were Private 75. He later joined the 1st Australian Machine Gun Company, were he was appointed to L/Cpl on 13th July 1917. The records further show that he arrived in France on December 17th 1916, and spent some time at Brigade School, after which he rejoined his unit on September 30th 1917. Only four days later he was wounded in action on October 4th. He was admitted to the 2nd Canadian Casualty Clearing Station the next day, with gunshot wounds to the chest, and a fractured right thigh. Thomas died of his wounds on October 8th. In the event of my death I give the whole of my property and effects to my sister, Mrs Lilian Brookes. Another record states that there were no personal effects in his kit. Thomas is buried at Lyssenthoek Military Cemetery, which is one and three quarter miles south-west of Poperinghe, France. By submitting his name for the Prestatyn War Memorial, Mrs Brookes was ensuring that Thomas would be remembered. Thomas’ service records from the National Archives of Australia.